Curbed Hamptons readers might have a love/hate relationship with Bruce Buschel, the blogging owner of Southfork Kitchen, but when it comes to the food served there, the locally-sourced restaurant came out on top. It was voted the best restaurant in the Hamptons. Southfork Kitchen is committed to one idea and has delivered a singular result: Joe Isidori's intensely focused New American cooking. His setting is dramatic, defined by vintage wood and recycled steel that have found new use. Nassau bricks line the entryway. An upstate New York firehouse has yielded the floor. The ceiling: reclaimed red cypress. The look is spare and rich, industrial and rural, nearly monotone, interrupted by a fireplace and a stirring black-and-white image -- a piece of Robert Motherwell's "elegies" to the Spanish Republic. The menu reads, naturally, like a geography text. The website's list of credits is long and local. Southfork Kitchen has long existed in blog-world via postings from owner Bruce Buschel in the New York Times. His noisy, insistent, meticulous reality is even better. Isidori, whose resumé includes a stint with chef Rick Moonen in Las Vegas, may give you an amuse of ocean-sweet Beau Soleil oysters with salmon roe and Wölffer Estate verjus or cucumbers from the garden in front of the restaurant. 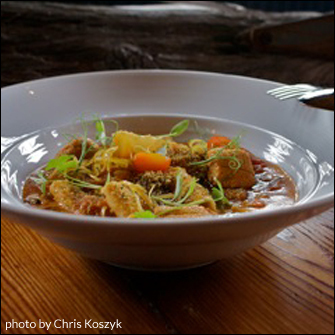 Look for the deeply flavorful clam chowder, with soy-cured bacon and vegetables. The smoked bluepoint oysters with Balsam Farms corn and a North Sea Farms sous-vide egg: savory and sensational. Heirloom tomatoes and preserved Meyer lemon accent lustrous Peconic Bay fluke tartare. Meyer lemon, English peas and hazelnuts gild pan-roasted rainbow trout. Crisp Mediterranean sardines, with aioli, salsa verde and black olives, are stellar. Keep the theme with soulful pappardelle pasta tonnato with tuna, olives, garden chives and anchovies. Veer east for outstanding Montauk bluefish au poivre, finished with David Falkowski's Bridgehampton mushrooms and Balsam Farms onions. Catch sweet soft shell crab alla zucca, with squash, fried egg and speck. Enjoy warm Valrhona chocolate cake with salted caramel ice cream and cocoa nibs; the cookie plate; the petits fours. This is serious local, organic when possible, sustainable stuff. Suppliers are listed on the back of the menu. It reads like a poem in the New Yorker. Chef Joe Isidori has sworn a vow to the guidelines of the Blue Ocean Institute and Monterey Bay Aquarium. Thick slices of toasted brioche and whole grain bread in rustic wood holders a kid would turn out in grade school shop class, butter with espelette pepper in a little dish paved with Ocean Road seasalt and Southampton honey. The owner, Bruce Buschel, produces the salt himself. If I weren’t swooning over the prelude – a gift of oysters topped with yuzu-marinated salmon roe on seaweed made Christmasy with red berries – I might be annoyed at the obsessiveness. 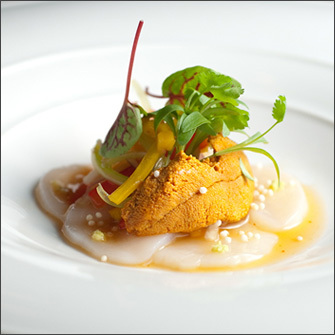 But now my senses are staggered by even more daring: rounds of satiny sea scallop alongside the intense sweetness of compressed melon with a briny accent of sea urchin. The house clam chowder is thick with bits of soy-cured bacon and garden vegetables. A slow-cooked farm egg in a corn and green bean chili butter emulsion with smoked blue point oysters and snippets of purple flowers tickles my taste buds with such earthiness, I am reluctant to share it. Well, maybe the kitchen is somewhat slow, given a full house crowded, tables turning. Maybe the farm-smoked duck could be rarer, less chewy. Granted, my guy’s pappardelle with tuna sauce, anchovy, olive and garlic butter tastes muddy to me. Our friend across the table clearly disagrees. She has pushed aside her fish and is finishing his abandoned pasta. It’s sheer chance that my sous vide egg starter is followed by fried egg crowning a soft shell crab. Even so, this may be the crispest and cleanest fried crab I’ve had all season and it gains nothing being crowned with a chapeau of egg. It doesn’t need wings of speck Americano either, but the egg is more bizarre. Still it’s real food and not chemistry that captivates Isidori. I am eager to taste more of his poetry. The entrees are largely from the ocean. In fact, on the night we visited, the staff had just come from a meeting with Blue Ocean Institute. They had convened to learn more about ocean conservation. The Dirty Martini was made with LiV vodka and three meaty olives stuffed with bleu cheese -- my meal was off to a solid start. It's always fun to see highly educated, articulate people reduced to "oohs and ahs" over food. The surprise hit for me was the Kirby cucumber amuse bouche that Chef sent out. The cukes were simply drizzled with a light Meyer Lemon preserve. So fresh! I quite enjoyed my Southfork Kitchen Clam Chowder. It's neither "Manhattan" nor strictly "New England." The clams were accompanied by soy-cured bacon and garden vegetables. A beautiful presentation, the dish was well balanced and the note of cumin played just right. The Montauk Lobster Potage had smoked garlic, tarragon and root vegetables. Brilliant. It was at this point that we started to mark the quality of the vegetables. All of the vegetables were notably fresh and hey were cooked to perfection -- fully done but yet with a slight crispness. I don't know how Chef Joe Isidori works this magic but it no doubt relates to the fact that the vegetables were cooked separately from the chowder. The creamy liquid of the dish was poured over the solids at table. Apparently a crucial flourish. In the Pappardelle "Pasta Fatta in Casa," Noyac Bay clams, red chilies and some garlic from Amagansett worked their magic. I chose an old Friday night standby--haddock. 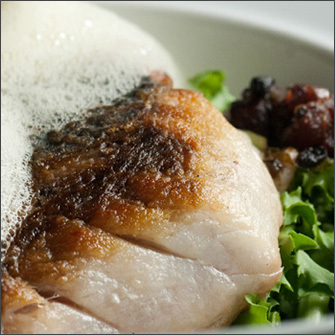 But Blackburn's Haddock served with Jacob's cattle beans, chorizo and escarole is no "fish fry." The perfectly cooked fish arrived in a delightful bath of orange foam. The beans provided tasty alternative bites to the fish and the chorizo infused all with a bacony flavor. Oh my. Not everyone who accompanies me to a restaurant dinner makes it to dessert. Both of my cohorts went for a Warm Valrhona Chocolate Cake with Salted Caramel Ice Cream. They agreed that the butterscotch crunchiness, the hot, the cold, that bit of salt in the caramel rendered this dish "outrageous." I ordered a Meyer Lemon Tart. Remarkably fresh red and yellow organic raspberries topped a sour cream tart. It worked. It really worked. Chef also sent out a cookie plate--don't miss sampling the utterly buttery brittle. 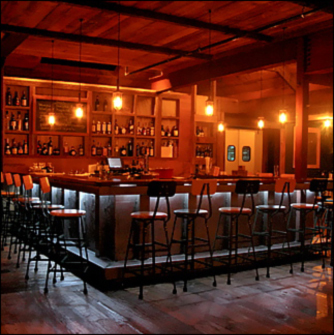 Southfork Kitchen offers an ample wine list featuring many local favorites including Grapes of Roth, Lieb, Lenz, Peconic Bay, Roanoke and Wolffer as well as other New York State wines, West Coast wines and international wines. Beers include Blue Point, Greenport Harbor and Captain Lawrence. It will be entertaining to follow how the Southfork Kitchen's menu changes with the season. In fact, Amagansett filmmaker Don Lenzer is making a film about this restaurant. Isidori is definitely a young chef to watch. Upon being seated, or stooled, we got a basket of warm slices of brioche and little ramekins of homemade butter, which had been molded into a little wheel, the center filled with local honey and the top artfully sprinkled with paprika and sea salt. Rich, sweet, and delicious. An amuse-bouche followed, a baby new potato topped with creme fraiche and American caviar. So delicious, so small. There was a little drizzle of bright orange, hot chili oil, which gave them a nice spicy touch. For appetizers we ordered the arctic char tartare, fluke sashimi, Accabonac Harbor oysters, and Berkshire pork belly. The arctic char tartare was beautifully presented and well seasoned with coriander and chorizo oil, giving it a smoky, spicy edge. The fluke sashimi was also excellent. The soy-dashi dressing was salty and sour and the honey crisp apples gave the dish some sweet crisp texture. There were also a few Mexican cucumbers tossed in, which didn’t add much but they were cute and look like little mouse watermelons. The Accabonac oysters were good, but Peter, the purist, said he would have preferred them virgin, not topped with Wolffer verjus and smoked caviar. The Berkshire pork belly was divine. Tender, smoky, and fatty, this is a delicious indulgence when properly prepared. It was served with watermelon, black garlic, and yuzu, a Japanese citrus that cut the richness very nicely. Before our entrees arrived we shared the garden salad. The greens were fresh and crisp and topped with a buttermilk and goat’s milk blue cheese dressing. It was tangy and the goat’s milk blue cheese was mild and sparse enough to not overwhelm the delicate greens. For entrees we tried the Goffle Road Farm’s roasted chicken, crispy boneless porgy, Icelandic arctic char, and striped bass. For a side dish we ordered the Satur Farms crispy potatoes. The chicken was served in a piping hot cast-iron skillet, as were a few of the other dishes. The skin was crisp, the meat flavorful. It was served with a sous-vide egg, root vegetables, wax beans, and salsa verde. Sous vide is a method of cooking food vacuum-sealed at a lower temperature. It has become popular with many high-end chefs, and in this case, it worked. The egg was creamy and silky, almost like an aioli on the chicken. The porgy was also very good, perfectly crunchy on the outside without drying out the lean white fish within. Best of all, however, was the superb celery root remoulade underneath it. The root had been cut into tagliatelle-like strands, long and thin and coated with a pungent, mustardy dressing. The arctic char was very good, cooked just enough, with a slightly sweet sesame oil flavor. The striped bass was excellent, served with bok choy and radish in a coconut milk curry sauce. The crispy Satur Farm potatoes were also excellent, sprinkled with a bit of paprika and topped with another egg sous vide, creating a rich, creamy dipping sauce. The menu at Southfork Kitchen is innovative, original, and as true to Mr. Buschel’s mission statement of sustainability and local ingredients as can be. It is also very expensive. The porgy was $29. The chowder is $12. The wine list, which is well thought out, showcases a great number of Long Island wines, and is quite reasonable. Prices for appetizers are $10 to $17, $12 to $29 for dishes that can be shared or doubled or tripled per person for the table, $25 to $36 for entrees, $8 and $9 for side dishes, and $10 to $18 for desserts. Toward the end of our meal, my guest, Michael, pointed out Mr. Buschel sitting in a corner at the bar. Bruce (may I continue to call you Bruce? ), why so glum? You sat there looking filled with ennui. Why no glad-handing and table-hopping and greeting your guests? You should be proud. You have accomplished what you set out to do, shared every nail-banging nightmare, every permit procurement, every theory of restaurant management. May I be the first critic to say congratulations? It would be an understatement to say that a lot of thought went into Southfork Kitchen, the just-opened, year-round restaurant in Bridgehampton. Owner Bruce Buschel, who has written for GQ, Rolling Stone and The Village Voice, chronicled his “work in progress” for over a year on the Times’s You’re the Boss blog, generating a heaping helping of crowd-sourced advice. When all was said and done, he had found a great chef who shared his fondness for seafood and veggies, and lined up the farmer and fisher contacts to supply that chef (Buschel is on the board of EECO Farm in East Hampton). The location ain’t too shabby either—the former Wild Rose, a roadside entertainment venue since 1900, holds fond memories for anyone who partied in the Hamptons in the 1980s and 1990s. On a recent night, as diners settled into the dim, cozy, wood-clad interior, a few ball-capped gentlemen saddled up to the bar, perhaps thinking that the Rose was open again after all these years. “The alchemy lives on in the ground,” said Buschel. And it lives on in the food too, where we were sated and dazzled, by course after course bursting with ultra-fresh vegetables like cauliflower gratin; sea life like scallops, clams (served with pasta and kimchi) and oysters; and flavors seldom tasted this side of Flushing Meadows. Captained by Chef Joe Isidori, born and raised in Yonkers, and formerly a chef at Pacific East in Amagansett and at DJT at the Trump International Hotel in Las Vegas, where he earned a Michelin star, this seafood joint bucks convention by skipping popular salmon and tuna, as well as cod and farmed seabass-—in a sort of inverse homage to Paul Greenberg’s Four Fish. There’s no swordfish either, even the kind caught off Montauk. But there’s plenty of other, less conventional local tasties, including recently porgies that had been boned out, fried until crispy and served on top of a celery root remoulade with organic jalapenos-—a dish that attracted praise from the East Hampton Star’s Laura Donnelly. There has already been both tautog (blackfish) and squid a la plancha. And the chef is looking for a Long Island lobster source—despite dismal supplies. And then there’s the kimchi...It could well be the only kimchi on a restaurant menu east of the Canal. Chef Isidori says Southfork Kitchen is giving him a chance to “practice what you preach” in a way he couldn’t necessarily in big city venues. “Now I get my tomatoes from Dale and Bette, one mile away,” he says. “The bayman calls me when he’s got some tautog or bay scallops.” The wine and beer are heavily tilted towards the Empire State too. And “Joe,” for the uninitiated, is Chef Joe Isidori, most recently the chef at Harbour in New York’s SoHo and before that the ersatz major domo of all things culinary for Donald Trump. 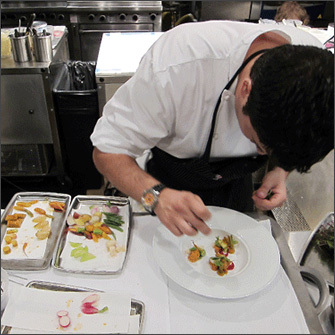 Awarded a scholarship to the Culinary Institute of America in Hyde Park, NY, at 21, Isidori was hired as chef de cuisine by the Nemo Restaurant Group in Miami, FL almost as fast as he could remove his cap and gown upon graduation. Three years later Trump hired him as chef for the real estate mogul’s golf clubs in New York, New Jersey and Palm Beach. A year after that he was promoted to vice president of food and beverages for Trump’s hotels and society events. So much for Isidori’s relatively short, but impressive resume. It is at Southfork Kitchen where the young chef has a license to truly flex his creative muscles, encouraged and enabled by first time restaurateur Buschel, who’s relaxed yet focused ideas and approach to opening a fine dining establishment in the Hamptons - copiously documented in his New York Times blog, “You’re The Boss,” is, arguably, at once fresh and slightly reckless. To wit: “I hired Joe without ever tasting anything he cooked,” admits Buschel. But no matter. Buschel is savvy enough to recognize major talent when he speaks to it, and he hired Isidori on instinct and a gut feeling that he and the young chef could be of one mind in finalizing the Southfork Kitchen’s culinary concept, which leans decidedly seaward for the most part. And based on the inventive dishes that came from Isidori’s brand new kitchen on Wednesday evening, Buschel is batting a thousand on his instincts for spotting rare gems in a sea of mediocrity. Here’s how Wednesday evening’s preview dinner “for family and friends,” went, courtesy of Buschel’s largess: First came an amuse bouche of fresh lobster salad formed into a round the size of a small hockey puck. Bright, citrusy, sweet and clean, the texture of this tasty tango was given an element of surprise with crispy mini croutons in the mix. Brilliant. Next up as an appetizer was a thick wedge of Hudson Valley Pork Belly, slightly crisped on top, with melt-in-your-mouth, succulent pork below, served with a Kimchi flavored diced watermelon and cucumber salad. The Southfork Kitchen Clam Chowder was a dark, spicy potage inhabited by soy-cured bacon, garden vegetables and perfectly poached local clams. In between courses a fresh garden salad “for the table” was served - an interesting amalgam of chunky tomatoes, diced beets, roasted fennel and cucumbers in a wooden bowl swimming in a creamy dressing of Evan’s buttermilk and Ewe’s blue cheese that you tossed yourself then poured into separate bowls of Amber Waves lettuces. A bit tricky, and not a little awkward, but a decidedly novel way to serve salad. As for entrees, a gorgeously seared fresh slab of Arctic Char sat in a flavor pronounced white miso and tomato “fondue,” book-ended by two white balls of poached baby turnips. It was, in short, spectacular. For dessert, tender green figs and tasty Italian prune plums co-mingled in a pool of local sheep’s milk yogurt dotted with almond crumble and Thai basil leaves. More than a little unusual and not something I would normally order but enjoyed nonetheless. Buschel chose to pour Long Island wines exclusively, though the eventual wine list, he says, will be inclusive of wines from all over, with a heavy emphasis on Long Island producers. Last night, Paumanok’s 2008 Sauvignon Blanc, a zesty quaffer with hints of grapefruit and lemon zest, was poured from a tap at the cedar top bar, while 2007 Pinot Noir from Castello di Borghese was an excellent choice for a local red wine that pairs particularly well with seafood. With the faint aroma of new cedar permeating the air, the interior of Southfork Kitchen resembles that of an urban modernist’s vision of a country barn. The décor is spare and tasteful, mostly masculine in style yet comfortable and inviting. A wood-burning fireplace is built into one of the walls, which will be lit during the colder months. There is still much work to be done before Buschel’s and Isidori’s vision of Southfork Kitchen is fully realized, but from the glimpse of this new and iconoclastic restaurant I was privy to this week, expect a bright new culinary star to shine brightly on the East End come this weekend.